The collection “Stones and Vessels” is the result of a journey of formation that has been underway for 40 years – or even longer. After growing up with an architect mother, and with continual development work, enormous freedom to enjoy beauty and ugliness alike, and a Waldorf school aesthetic, at age 20 Ann Wåhlström saw herself as a future ceramist. 1977 she enrolled in a year-long ceramics course at Malmsten’s Capellagården school on the Swedish island of Öland. Småland was home to the glass school in Orrefors, where Wåhlström continued her studies. During her training at Orrefors, Ann Wåhlström realized that she had to broaden her prospects and supplement her newly acquired expertise. That year, 1979, she went to Pilchuck, north of Seattle. 1981, she spent one academic year as a special student at the University College of Arts, Crafts & Design in Stockholm, studying under Paula Bartron and Bertil Vallien. Back in New York, Larry Jasse and Ann Wåhlström decided to be traveling glassblowers. There were opportunities for work at the New York Experimental Glass Workshop (NYEGW), but also for temporary periods in both Switzerland and Sweden. 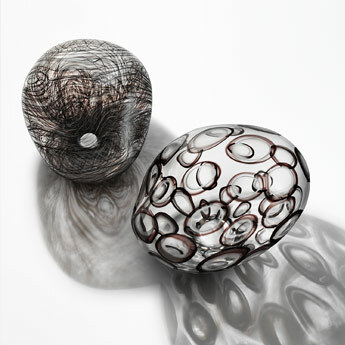 The first glass Ann Wåhlström exhibited for an audience in Sweden, after her year of study in Stockholm, was at the University College of Arts, Crafts & Design’s spring exhibition in 1982. She had experimented with boldly colored cones and hemispheres, some decorated audaciously with small cylindrical details. A few years later in 1985, Ann Wåhlström had her first solo exhibition at Gallery Nilsson New Glass in New York. After the exhibition, Ann Wåhlström joined Kosta Boda’s designer group. The following year, the first results were presented in a show entitled “Saturnus” at the company’s showroom at the time, which was housed in a former bowling alley on Djurgården. In an engaging project, 1995, Kosta Boda had each of their designers invite a guest artist to make their own work and generate a discussion together about form and materials. Ann Wåhlström invited artist and illustrator Mats Gustafson, who had also been a friend and source of inspiration in New York. His fashion designs, often done in watercolors, have a certain kinship with her sketches. She reckons his pure forms have certainly also influenced her own clear and balanced style. The collaboration was presented in the exhibition “Eight Visitors – Sixteen Friends.” The Gustafson/Wåhlström duo, both of whom worked with clear and violet glass, garnered significant attention for their organically austere shapes, which, naturally, captured the room with an inherent strength. 1999 she made her comeback at the Småland Museum in Växjö with the exhibition “Cyclone,” curated by Tom Hedqvist, who had also designed many of Wåhlströms earlier exhibitions. The theme comprised movement and spirals, particularly the significance of both phenomena, which had been part of her experience during a tough time in Wåhlströms life. The exhibition was Ann Wåhlström’s second major breakthrough – especially the brilliant, thinly blown Soapbubbles. Director Pia Forsgren attended the exhibition and was fascinated by the combination of frailty and grandiosity in the forms. For a long time, she had been planning to stage “Different Trains” by American composer Steve Reich with the Flesh Quartet at the Jewish Theater in Stockholm. “Different Trains” premiered in 2008 to enormous acclaim. After 60 performances, it toured Jerusalem with 25 performances three years later. There was also a revival in Stockholm in 2012, with another 25 performances. Since 2017, a part of the glass installation set has been on display in its own room in the newly opened Swedish Museum of Performing Arts in Stockholm. Departing Kosta Boda in 2005 led to Ann Wåhlström’s establishment as a freelance designer and artist; she has produced glass for Svenskt Tenn and Design House Stockholm. And she has returned to Dale Chihuly and the birth-site of her career to continue making her own unique glass pieces in the studio at the Museum of Glass in Tacoma, USA. This freedom has allowed her to hone her modernist sensibility into new strengths: large cylinders and teardrop shapes with audaciously nonchalant geometric patterns that are featured, among other places, in five solo exhibitions at Galleri Mårtenson & Persson in Stockholm, and at the Swedish Glass Museum in Växjö. The debut of “Stones and Vessels” at Galleri Glas is the beginning of a new chapter of her artistic development.